There is epidemiological evidence for an increased prevalence of occupational asthma among radiographers. However, the causes of darkroom disease are not yet defined. A 37-year-old female radiographer reported work-related asthma ∼2 yrs after starting work in a local hospital. She was atopic and showed bronchial hyperresponsiveness to methacholine. Occupational-type exposure with a fixing agent, but not with a developer, produced an immediate-type asthmatic reaction. As the fixing agent contained sodium metabisulphite (SMBS), a substance known to cause asthma, bronchial challenges with SMBS were performed in the patient and nine asthmatic controls. The patient showed a positive bronchial immediate reaction on 2 separate days after inhalation of 48 and 96 µg SMBS, and one control also showed a significant fall in forced expiratory volume in one second after inhalation of 12 µg SMBS. The positive reaction in the control subject argues for a greater susceptibility of both persons to SMBS or its reaction product sulphur dioxide, rather than for a new occupational allergen. It is concluded that sodium metabisulphite exposure should be recognised as a cause of darkroom asthma. There is epidemiological evidence for an increased prevalence of occupational asthma among radiographers 1, 2. Symptoms of the eyes, nose and airways (darkroom disease) suggest irritative or allergic mechanisms caused by chemicals. However, these are not yet defined. A 37-yr-old female radiographer developed asthma in the workplace ∼2 yrs after starting work in the department of radiology of a regional hospital. There was a complex exposure to powdered latex gloves, as well as various disinfectants, developers and fixing agents. She had developed seasonal rhinitis 5 yrs earlier, which disappeared when work-related shortness of breath occurred. Asthma was noticed almost exclusively on exertion and while loading radiographic processing chemicals into an automatic processing machine in a small poorly ventilated darkroom of ∼9 m2. She left her job 6 yrs later due to increasing airway symptoms and medication with β-agonists. Diagnosis was made 2 yrs later; she was without any medication and completely free of symptoms. The patient underwent physical examination, lung function testing and routine laboratory tests. Skin-prick tests were performed with a battery of 20 environmental allergens (ALK-Scherax, Hamburg, Germany). A positive reaction was defined as a weal diameter of ≥3 mm with a negative saline control. Total immunoglobulin (Ig) E was determined by AutoCAPTM (Pharmacia, Freiburg, Germany). Specific IgE to latex was measured with UniCAP® (Pharmacia). Spirometry was performed with a Masterlab (Viasys, Würzburg, Germany), according to American Thoracic Society (ATS) recommendations 3. All measurements, including methacholine testing and challenges with sodium metabisulphite (SMBS), met ATS acceptability and reproducibility criteria. Bronchial hyperresponsiveness was assessed with methacholine as recently described 4. The provocative dose of methacholine causing a 20% fall in forced expiratory volume in one second (PD20) was calculated by logarithmic interpolation. Bronchial hyperresponsiveness was defined as a ≥20% fall in forced expiratory volume in one second (FEV1) with a cumulative dose of ≤0.46 mg methacholine (dose measured at the mouth). Nine asthmatic control subjects were examined by methacholine and SMBS testing (table 1⇓). The patient and all control subjects gave informed consent for the tests. Occupational-type tests were performed only in the patient, with her breathing ∼20 cm above a 20-cm-diameter glass bowl containing 500 mL of the substance in a small exposure cabin. For the first challenge of the patient with SMBS (Sigma, Taufkirchen, Germany), solutions of SMBS were prepared in phosphate buffer (reagents from Merck, Darmstadt, Germany), pH 7.4, 16 h earlier and stored in round 30-mL flasks with a surface diameter of 32 mm and filling volume of 4 mL. As shown by ion chromatography using suppressed conductivity detection, this resulted in an overnight decrease in SMBS concentration of up to 79%, which could be minimised to 37% by using flasks with a small surface area. This loss was further minimised by fresh preparation of the solutions for further challenge tests (controls and second patient challenge). In the first challenge with SMBS, the patient inhaled concentrations of 0.95 µg·mL−1 to 4 mg·mL−1 in doubling doses via an APSpro dosimeter with a MedicAid nebuliser (Viasys) with an output of ∼240 mg·min−1. Five total lung capacity manoeuvres performed over 4–5 s at a flow rate of ∼1–1.5 L·s−1 and nebulisation periods of 0.6 s (0.5 s after initiation of each breath) yielded doses of 12 ng (0.06 nmol) to 48 µg (0.25 µmol). For the second challenge, SMBS concentrations in doubling doses between 0.25 mg·mL−1 and 8 mg·mL−1 (doses between 3 µg (0.016 µmol) and 96 µg (0.5 µmol)) were used. FEV1 was measured 1 and 5 min after each inhalation step. Challenges were terminated if symptoms of shortness of breath, combined with a fall in FEV1 of ≥20%, were documented (the challenge with the fixing agent was terminated after a decrease in FEV1 of only 12% according to the patient's wishes). The patient showed normal physical examination, and laboratory and lung function test results. The total IgE concentration was 666 kU·L−1. Skin-prick tests revealed sensitisation to house dust mites, cat, trees and grasses. Latex sensitisation was not detectable (skin-prick tests and specific IgE in serum). Skin-prick tests with 80 mg·mL−1 SMBS, as well as a developer and a fixing agent from the former workplace, gave negative results. Methacholine testing showed bronchial hyperresponsiveness with a PD20 of 16 µg (table 1⇑). 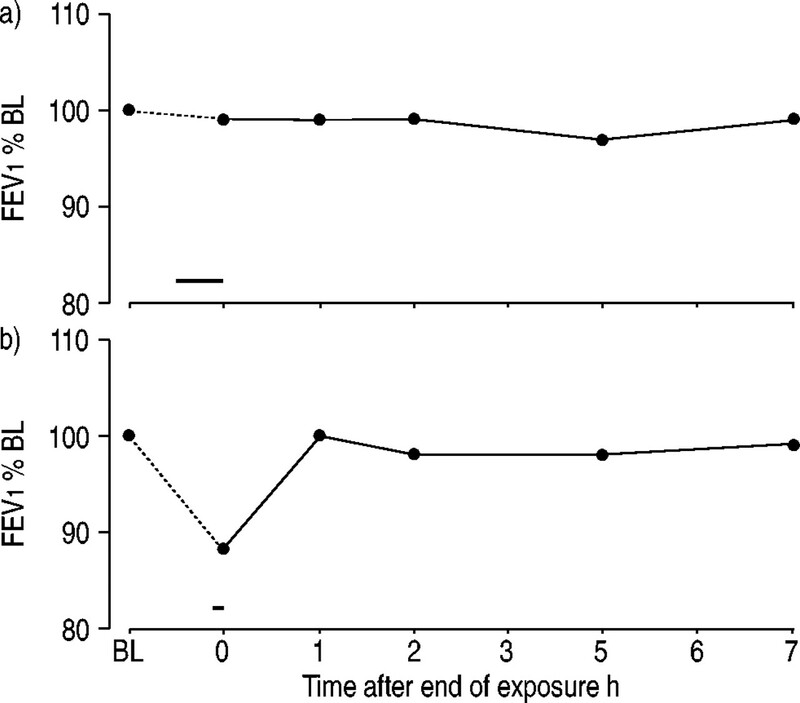 Occupational-type exposure to the fixing agent Agfa G334 (Agfa-Gevaert, Leverkusen, Germany) produced asthma symptoms and an obstructive airway response after 5 min (fig. 1⇓). No such reaction was found, on the following day, with the developer Agfa G138 (fig. 1⇓). As SMBS was a component of the fixing agent known to cause airways obstruction, challenge with SMBS was performed. This challenge resulted in a positive early reaction (fig. 2⇓). In order to compare the challenge dose of the patient and asthmatic control subjects, nine control subjects with mild asthma and bronchial hyperresponsiveness, but without occupational contact with SMBS, were challenged (table 1⇑). In preparing this series of tests, it was noticed that SMBS concentrations decrease overnight, depending on the initial SMBS concentration and flask surface area. Thus, tests in controls and the second challenge in the patient were performed in an identical manner with freshly prepared solutions, which were stored for only a few minutes in a flask with a small surface area (fig. 2⇓). Although there were positive early reactions in the patient, with a fall in FEV1 of ≥20% with doses of 24 µg (0.13 µmol) in the first challenge and 96 µg (0.5 µmol) in the second, only one control subject exhibited a positive SMBS reaction, with a 27.9% fall in FEV1 after 12 µg (0.06 µmol) SMBS (subject No. 4; table 1⇑). Patient challenge (horizontal bar) with a) the developer Agfa G138 (30 min) and b) the fixing agent Agfa G334 (5 min). FEV1: forced expiratory volume in one second; BL: baseline. Patient challenges 1 (a) and 2 (b) with sodium metabisulphite (SMBS; ▓). Forced expiratory volume in one second (FEV1) was measured 1 and 5 min after each inhalation step (……: 20% fall in FEV1). BL: baseline; PBS: phosphate-buffered saline. Thresholds for positive bronchial reactions in the patient and the control subject showing a positive reaction were lower than the data reported in the literature, with thresholds of ∼2 µmol SMBS 5. A wide threshold range is known to exist for sulphur dioxide (SO2) challenges in humans 6. SO2 is a reaction product of SMBS and water, and is probably the agent responsible for the bronchoconstriction. 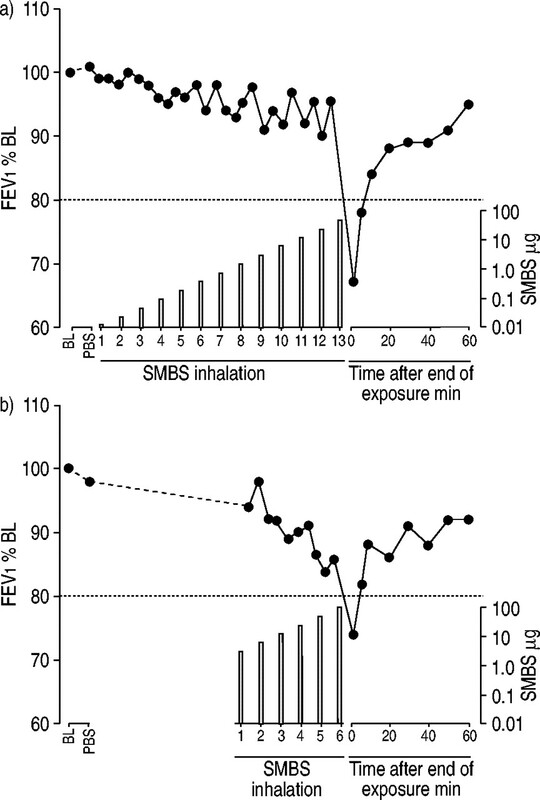 The history of the present atopic patient, with complete recovery after exposure cessation, suggests that SMBS/SO2 was the major cause of the patient's asthma, but the positive reaction in one control subject argues for a greater susceptibility to SMBS/SO2 of both persons, rather than for a new occupational allergen. This interpretation is strengthened by the negative skin-prick test result with SMBS of the patient. In conclusion, sodium metabisulphite exposure should be recognised as a cause of darkroom asthma, and primary and secondary preventive measures should be taken. In industrialised countries, this occupational hazard will disappear with time due to increasing use of digital radiography and dry laser image technique. Smedley J, Inskip H, Wield G, Coggon D. Work-related respiratory symptoms in radiographers. Occup Environ Med 1996;53:450–454. Dimich-Ward H, Wymer M, Kennedy S, Teschke K, Rousseau R, Chan-Yeung M. Excess of symptoms among radiographers. Am J Ind Med 2003;43:132–141. American Thoracic Society. Standardization of spirometry, 1994 update. Am J Respir Crit Care Med 1995;152:1107–1136. Baur X, Huber H, Degens PO, Allmers H, Ammon J. Relation between occupational asthma case history, bronchial methacholine challenge, and specific challenge test in patients with suspected occupational asthma. Am J Ind Med 1998;33:114–122. Wright W, Zhang YG, Salome CM, Woolcock AJ. Effect of inhaled preservatives on asthmatic subjects. I. Sodium metabisulfite. Am Rev Respir Dis 1990;141:1400–1404. Nowak D, Joerres R, Berger J, Claussen M, Magnussen H. Airway responsiveness to sulfur dioxide in an adult population sample. Am J Respir Crit Care Med 1997;156:1151–1156.